1 of 4 Place shrimp in large resealable plastic bag. Add white wine and 2 teaspoons of the minced garlic. Marinate at room temperature 30 minutes or in refrigerator for a few hours. 2 of 4 Cut grape tomatoes in quarters. Heat oil in medium-size skillet over medium-low heat. Add the remaining garlic and cook 1 minute; add tomatoes and cook 1 to 2 minutes or until slightly softened. Stir in basil then remove from heat. 3 of 4 Heat gas grill to medium or prepare charcoal grill with medium coals. Remove shrimp from marinade; discard marinade. Place shrimp in a grill basket and grill 6 minutes, stirring. Remove and cut in half crosswise, if desired; stir into tomato mixture. 4 of 4 Cut 8 slices bread, about 1/2-inch thick. Brush both sides with a little of the oil from the tomato-garlic skillet. Grill bread 3 minutes per side, until golden-brown. 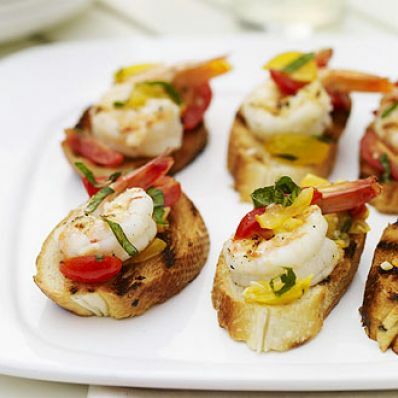 Serve topped with shrimp-tomato mixture; sprinkle with a little sea salt, if desired.